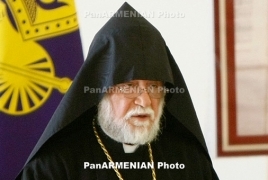 PanARMENIAN.Net - Catholicos of the Great House of Cilicia Aram I has thanked French President Emmanuel Macron for his decision to designate April 24 a "national day of commemoration of the Armenian Genocide". The Catholicos said he believes the decision is the expression of Macron’s connection with justice, historical truth, and the recognition of the first genocide of the 20th century. Speaking to the Armenian community at a dinner in Paris, Macron said France was one of the first nations to denounce the killing of the Armenian people for what it was. "France is, first and foremost, the country that knows how to look history in the face," he said.